Lanzarote’s original holiday resort of Puerto del Carmen remains as popular as ever, regularly topping the tourism visitor figures for the island. The holiday resort was established with the construction of two hotels in the 1960’s, the Los Fariones and the San Antonio, both of which still exist today. Puerto del Carmen starts in Matagorda by the airport and stretches along Avenida de Las Playas, fondly referred to as The Strip to the old town area built up behind the harbour. The promenade stretches 6km linking the main beaches of Playa Matagorda, Playa Los Pocillos, Playa Grande and Playa Chica, all of which have blue flag awards, sun beds for rent and lifeguards on duty. The harbour area is known as La Tiñosa, the name of the fishing village before tourism arrived. The accommodation in this resort was predominantly constructed with apartment complexes, and 4* hotels, plus a limited amount of villa properties available for holiday rental. Puerto del Carmen, due to it’s age, has undergone some modernisation projects over the last decade which saw a large section of The Strip converted into a 1 way system, with modern glass fronted shops, and hotels renovated including Aequora Lanzarote, La Isla y El Mar, Lanzarote Palm, Aqua Suites and the Lani Suites. From 2019 Puerto del Carmen is due to have two 5* hotels in operation, named as the Lava Hotel and Los Fariones. If you’re looking for a lively resort then look no further than Puerto del Carmen. Centro Atlantico is the area for late night clubs, and many of the bars along The Strip offer live music entertainment. Both Matagorda and the old town area of Puerto del Carmen are loved by our Irish visitors, to the extent they celebrate St. Patrick’s Day with a parade. The island has also won the Best Winter Sun Destination award several times, from the Irish Travel Agents Association. The front of Puerto del Carmen is fairly flat, the old town harbour area has a steep climb, as does the area immediately behind Playa Grande where we have a street known as “cardiac hill!” For visitors with walking difficulties the flatter areas around the new town, Los Pocillos and Matagorda are generally preferred. Puerto del Carmen has a huge range of restaurants of all types. You’ll find typical Tapas bars there, like Mardeleva in the old town, any number of British and Irish “pub grub” places, and dozens of restaurants offering International style menus. There are also curry restaurants and several large Chinese restaurants. Basically, you can get whatever type of food you want in Puerto del Carmen – you’ll even find a Burger King and a McDonalds in the resort if that floats your boat. In terms of top end cuisine, the resort now has The Kentia Gourmet Club, which is located in Hotel La Isla y El Mar, and chef Luis Leon serves some amazing steaks at his restaurant Toro. Plaza Varadero is the main area for events, the Fiestas de Nuestra Señora del Carmen is celebrated at the end of July / beginning of August with almost 2 weeks of traditional events centred around the harbour and a funfair. St Patrick’s day is huge in Puerto del Carmen and there is always a parade and the many Irish bars are buzzing. Carnival in Puerto del Carmen takes place every year in February, and starts with a parade of floats along the strip and finished with a huge party in the old town harbour. Christmas is magical in Puerto del Carmen – there is usually a Santa Parade and the decorations are fabulous, and of course, there’s nothing like spending Christmas day on the beach! 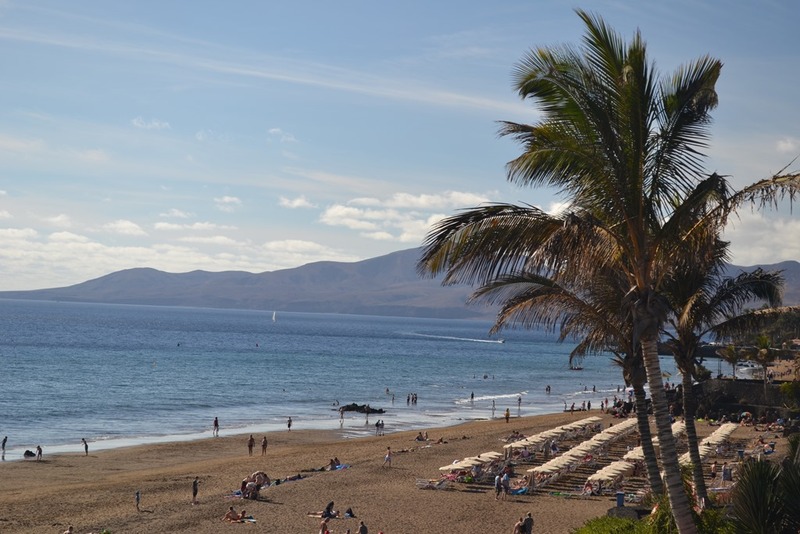 There are 8KM of sandy beaches in Puerto del Carmen! Starting at Matagorda, the beaches run all the way along the front of the resort, paralleling The Strip. Playa Los Pocillos at the Matagorda end is a very deep beach with masses of room. Heading towards the old town, there are several smaller beaches before you come to Playa Grande- the resort’s main beach, where you’ll find sunbeds, pedaloes to hire and an inflatable aquapark in summer. Just before the old town harbour, you’ll find Playa Chica, which is a lovely sheltered little bay. Watersports can be enjoyed from the small harbour at Playa Chica, including jet ski and parascending. Puerto del Carmen is an excellent resort for scuba diving, there are many schools in the area offering courses, guided dives and try dives. In the summer there is a floating Aquapark off Playa Grande, which is great fun! A weekly market is held on a Friday at Plaza Varadero in the old town harbour area. There’s a selection of stalls including food, craft, souvenirs and the UD Lanzarote local football club. Puerto del Carmen has a shopping center at the top of the old town, called Biosfera Plaza. It has three storeys of shops, and an entertainment centre on the roof, with open air cinema, crazy golf and kids attractions. In the resort, you’ll find loads of shops selling beach gear, souvenirs and duty free tobacco and alcohol. Watch out for the electronic goods shops – if it looks too good to be true, it could be a fake! Puerto del Carmen is the least windy of the three resorts, and will often have fine, clear weather even when there is cloud inland. The ocean is protected by the large bay, so tends to be calm. Like the rest of the island, the sun shines almost every day, all year around, and the UV is high, so wear good sun screen. When it does rain hard, Carmen does tend to suffer from flooding. Puerto del Carmen is home to the iconic Ironman Lanzarote event each May, when around 2,000 triathletes and their supporters visit the island to compete in this gruelling race. The event starts at 7am with a 2,8km swim on Playa Grande, followed by a 180km bike course around the island, before finishing with a 42km marathon between Puerto del Carmen and Playa Honda. It’s a great atmosphere with crowds lining the streets, encouraging the participants until the finish time at midnight. There’s a cycle route all along the strip, and you’ll see many runners enjoying the flat, smooth pavements, running as far as Arrecife. Scuba diving is hugely popular, and Carmen has several excellent dive sites – The Cathedral, the main reef, a blue hole and a couple of interesting wrecks. Centro Deportivo Fariones is a sports centre open to all, and has swimming pools, a gym, and tennis and squash courts. Puerto del Carmen is the resort that appeals to the broadest range of visitors to Lanzarote – there’s something for everyone, from couples (both straight and gay) to families and youngsters looking for lively nightlife. In winter the resort attracts larger numbers of retired couples. More reading: Five special occasions restaurants in Puerto del Carmen. Beautiful, rural property, away from the tourist crowds but extremely close to the beach and village of Arrieta.